In her book, Living in the Chemical Age, Janet Newman lays out a solid plan to protect your family and yourself using some basic protective measures. In our discussion, Janet and I cover why chemicals are an issue, what is wrong with our drinking water, and how mold can become a huge issue.Allan (3:09): Janet, welcome to 40+ Fitness. Janet Newman (3:13): Thank you so much, Allan. It’s great to be here. Allan (3:16): So your book is Living in the Chemical Age, and it’s something that I’m always just vaguely aware of in the back of my head. It’s like, is this the best thing for me, and how am I doing this, or am I doing the right thing here? Your book really is a good primer, I think, for someone that is beginning to think about these things and how they can go about cleaning up their lives and trying to get some of these chemicals out of our life, rather than constantly be dealing with the toxic issues that we have. Both you and your husband had suffered from some of these problems, and that’s, I guess, what got you really interested in writing the book. Janet Newman (4:01): Yes, that’s true. I always was aware of what I ate and really tried to be health-conscious pretty much from my young adulthood on, but I wasn’t really aware of all the toxins that we’re bombarded with on a daily basis. It wasn’t until I started having my own health challenges in my early 40s that really started getting me on that track of, what is it that’s in our food and water and personal care products that might be causing some of these issues? Allan (4:45): I like how in the book you put the whole concept that our body is kind of like a silo. And as we just continue to pile on these different chemical exposures, there’s a cumulative impact. Can you talk a little bit about that? Janet Newman (5:01): Yes, I can. So I used the description of a silo, because I think it’s from my upbringing. I grew up in Michigan, and although I wasn’t in a rural setting, I did see grain silos periodically. And for me, when I think of the body’s immune system, if you will, and all the toxins that are accumulating, it’s easy for me to imagine a cylinder or a grain silo, if you will, that has different layers of these chemicals filling it up. I believe that if we take in more than we’re able to excrete, then those just keep piling up and up and up until it gets to the top. And that’s when we usually see some kinds of disease, or even just troublesome symptoms that start to appear, when our body can’t tolerate anymore and it just starts rebelling, if you will. It says that there’s a problem, and it could manifest itself in many different ways, from skin eruptions to headaches to inflammation. I think most of these chemicals that we’re being exposed to are man-made; they didn’t exist before the Industrial Age or maybe 100 years ago. So, I don’t think that our bodies have had an evolutionary chance to really adapt to all of these chemicals. And since our bodies can’t utilize or digest these synthetic chemicals, we’re challenged by them and they have a chance to potentially wreak havoc on our body. Allan (6:50): Yeah. And I don’t know that we want to adapt to these things, because there are some animals that do reproduce a lot faster than we do, and they’ve somewhat adapted to some of these things and it’s not all that pretty. So I’m not sure that adaptation is the right answer here. Probably 20,000 years from now, we might be able to handle something we’re doing today. But there are things we can do today and I wanted to get into a few of the things, because they’re all around us. I try to forget that it’s there sometimes, just for sanity’s sake, but it is always there. So, a few things that I did want to talk about. The first one is water, because I think more and more people are saying, “I’m not going to drink the tap water because of X, Y, Z problems”, and they’re going to the bottled water. But really, one might not be any better than the other. Could you talk a little bit about water, what we’re exposed to in a lot of our tap water, what we can do about it, and then when and how maybe bottled water could be an alternative? What are some things that we could consider as we’re going through this whole process of having cleaner water? Janet Newman (8:07): Sure, absolutely. Our bodies crave water, they need water to function. It’s just a matter of how clean the water is, and that’s what we really need to focus on. It’s not a matter of, “Should we switch to other beverages?” We need pure water to drink. One of the problems that I have discovered with our tap water – and we’ve all heard about the Flint water crisis and the lead. And that’s not just Flint, Michigan that has the problem; it’s anywhere that has corrosive pipes. There are several things that I discuss in my book that can lead to corrosion in pipes, but there are so many contaminants in our water. Part of it is that our municipalities that filter the tap water weren’t designed to filter out things like prescription drugs or birth control pills or industrial runoff. Some of the chemicals that we’re seeing are beyond what the filter’s capabilities are. So that’s definitely part of the problem with our tap water, is that we just don’t know what we’re getting. And I advise in my book to get your water tested professionally and see what is in there, so you know how to filter for it. 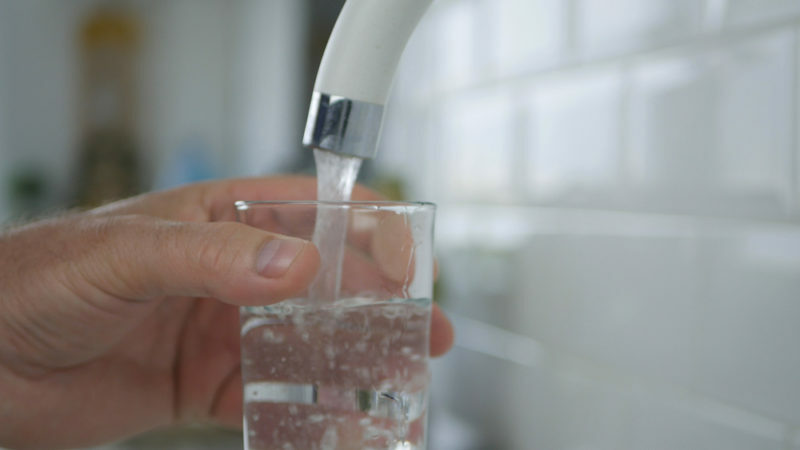 There are different filters and filtration systems that you can put on your tap, and depending on what you’re encountering, what kind of chemicals there are, we’ll tell you what kind of filtration system you need. And I do want to talk about bottled water. I’m actually thinking about doing a challenge for my people that are on my website, people that have read my book, but I think it’s really important. The challenge is to stop drinking bottled water out of plastic for 30 days. It really is not that hard, but I think we’ve just become so accustomed to the convenience of reaching for a plastic water bottle that sometimes we don’t even think about what the ramifications of that might be. One of the issues with plastic water bottles is the plastic itself. The plastic that is being used, if you look on the bottom, there’s a triangle and there’s a number 1 inside. That means that it’s made with PET plastic, and PET is an endocrine-disrupting chemical. What happens is when that ever heats up, say in a hot truck, or if you buy water that comes from overseas, for instance – there are many brands here, but there are many brands that we import. We don’t know the status of the temperature of those ships or those trucks that bring that water to our grocery store. So, when the PET gets hot, it leaches those chemicals into the water. So that’s the first problem. The second problem is that – and I just saw another study about this last week – little micro particles of plastic that are in the water from the plastic itself. The study last week that I saw said that most of the plastic is coming from the actual top of the water bottle. So that’s the second thing. We don’t want to be ingesting plastic, nor do we want to be ingesting the chemicals that come from the plastic. And the third thing is that the bottled water industry isn’t required to disclose the results of their water testing. So we may be just getting tap water anyway in there; it might not have any filtration. A lot of the bottled water that I’ve looked at the label and it does say that it has reverse osmosis or other types of steam distillation, other types of filtering processes, but some of them don’t. So, when we reach for that bottle of water, I think it’s really important to start thinking about all the different things that could be in that water. Allan (12:46): Yeah. It wasn’t this way 20 years ago, but now there’s an entire water section in the grocery store. There’s an entire bottled water section in the convenience store, if you’re traveling and you stop to get some gasoline, you walk in. Some of them are spring water, some of them if you actually read the label, it’s just municipal water, it’s tap water in a bottle. So now you’ve gotten the tap water and you’re drinking that; you’re just drinking it out of the bottle, which now, like you said, may be subjecting you to even more chemicals than it had when it was in the water system. Janet Newman (13:25): It’s true. There are two other factors with bottled water that a lot of people don’t think about, and that is the expense. It’s very costly to produce these bottle, and they’re produced through the oil and gas industry. PET is based from that. I think we’re thinking about cost and we’re also thinking about, what happens when we dump that water bottle? Where is it going? If we throw it in the garbage, then we have pollution to think about that eventually goes into the ground water and eventually it could make its way into our oceans. We have such a problem with plastic in our oceans. I’m sure everyone’s seen recently on Earth Day, some photographs of our plastic garbage patches in our oceans. It’s really kind of disgraceful that we’ve allowed it to get that way. So just thinking about, when you reach for that bottled water there are so many different avenues of why there is a better choice. I always say, filter your water at home, bring it in a stainless steel or a glass bottle, and carry that around with you every day. It’s not going to leach chemicals, we know that it’s filtered and it doesn’t contain any of the harmful chemicals in it from the beginning, and you’re not contributing to our environmental problem. I need to take just a minute away to talk about our sponsor, Teami Blends. Go to 40PlusFitnessPodcast.com/Tea to learn more about them. And use the coupon code 40plus to get 15% off your order of $30 or more. 40PlusFitnessPodcast.com/Tea. Thank you. Allan (15:15): Now, one of the other things about tap water that I think is interesting, and you highlighted this in the book as well, was not just what they’re not filtering out, but what they’re actually putting in. So they’re putting fluoride because we’re eating so much more sugar now, so our teeth are rotting. So they’re putting fluoride in the water to help keep our teeth from rotting. But that fluoride is not in the best interest of our health. Data is coming out now to basically show us that it’s really messing us up. Janet Newman (15:53): Yes. I think that in the 1940s there was a study that showed that people who lived near certain types of rocks called “calcium fluoride” had really great teeth. Unfortunately the type of fluoride that we’re putting in our water now is not calcium fluoride, it’s sodium fluoride, and it’s actually a byproduct of the fertilizer and aluminum industry. Basically this type of fluoride has shown to have many adverse effects to our health. One of the things that are most troubling is that it accumulates in the brain. It’s been shown to lower IQ and interfere with memory. So, definitely problematic. And from an aesthetic perspective, if you have too much fluoride in your body, it causes something called “dental fluorosis”. You may have seen people with this, but it’s like mottling of the enamel that has bright white spots on their teeth. Who wants that, really? But there are some good things that are starting to occur. They are doing more studies, and there are definitely some activists out there. One is called the Fluoride Action Network and they’re working with the EPA to try to eliminate fluoride in our municipal water supply. Allan (17:37): Well, good luck with that, because the EPA doesn’t really seem to want to help us out when it’s human health. It’s just crazy. Now, it’s starting to warm up and more and more people are going to be outside, and I encourage people to get outside. They’re going to want to probably apply some sunscreen. And you had a very interesting story. You were basically looking for a particular type of sunscreen that had zinc in it, rather than some of the other chemicals that they might use. And you were at what we would call it a “health store”. They build themselves out as a health store, but they weren’t carrying any brands that had zinc in them, because they said the customer demands sunscreen that absorbs in and doesn’t show white on their skin, and therefore they don’t carry it. At least carry one brand, even if no one’s hardly buying it. Carry it – you’re a health food place, after all. But could you talk a little bit about sunscreen, what we should look for when we’re trying to buy a good quality, healthy sunscreen? Janet Newman (18:45): Yes, absolutely. Sunscreens are basically divided into two categories – there are chemical sunscreens and there are mineral sunscreens. You can probably tell I’m going to tell you to use the mineral sunscreens. The chemical ones – a lot of them have been banned in other countries, which makes you sit up and take notice, why hasn’t the United States banned those? But they’ve been shown to cause free radical damage. They tend to enter the bloodstream. Instead of just coating your skin, they actually get absorbed into your body and they can do some not so nice things to your body. And it also is linked to the bleaching of coral reef. So if you’re going on a vacation where there is scuba diving or anything like that, just know that you could be potentially harming the environment as well. I like to stick to products that have zinc oxide in them. Titanium dioxide is another mineral sunscreen; it’s the only other mineral sunscreen. There have been a few studies lately, actually since this book has been written, where it shows that titanium dioxide may cause some issues to be concerned about as well, but that’s primarily when it’s in nanoparticle form. What I mean by that is when the particles are so small that they can be sprayed as opposed to applied like a cream or gel formulation. So because they’re so small, they tend to get absorbed into your skin as well, and there’s some speculation that that can cause damage. So what I like to say is that anything with zinc oxide is definitely safe, it stays on top of the skin. They’re starting to create formulas that aren’t nanoparticle size, but they’re not going to be as white and pasty looking as they used to be. When I think of zinc oxide, I think of those pictures in the ‘50s with surfers with the big white stripe on their nose. It’s not as bright as that anymore. But I think that sticking with mineral sunscreens is definitely going to be your safest bet. Allan (21:22): Okay, cool. I was sitting on my balcony this morning, and typically the wind blows well enough here that I don’t have to deal with mosquitoes too much, but I guess it wasn’t blowing enough this morning. So I’m sitting outside and the mosquitoes are having a nice feast breakfast on Allan. I don’t typically wear insect repellent at all. I have on occasion when I know I’m going someplace – particularly I’ve had some travels to Africa, and that’s not a place you necessarily want to play around with mosquitoes. If we’re looking for an insect repellent, what are some things that we should consider and be looking for with that? Janet Newman (22:04): Good question. A lot of people reach for the heaviest possible insecticide that they can find, carrying DEET. And DEET, I have to tell you, is a little stronger than you want to put on your body. It was formulated for World War II soldiers that were in jungle-like conditions to prevent malaria. But honestly, it is so strong and toxic that it can melt synthetic fibers, it can damage paint. I just think that if it’s something that strong, you really don’t want to put it on your body. DEET has been shown to absorb through the skin and it gets excreted through your kidneys. And who knows what it’s doing from point of entry to point of exit? I personally wouldn’t want something that can melt synthetic fabric being put into my body. The EPA says it’s safe, of course, and there are lots of products on the market that contain DEET, but I just don’t think we need something that strong. If you’re going to Africa or somewhere where there are a lot of mosquitoes and you’re bushwhacking through the rainforest or something, then there is something called “picaridin”. And picaridin is derived from black pepper, and it is super, super effective. In studies they show that it’s as effective as DEET, and it’s not going to have any of the safety risks that DEET does. So, my husband just went to Africa last summer and he used picaridin and he had amazing success with that. He didn’t get bit once. So, if you really need something strong and effective, I would suggest looking for picaridin. Now, if you’re just in the backyard or your kids are out playing, I would use something that has oil of lemon eucalyptus, because that is one of the only plant-based insect repellents that has been approved by the CDC to be super effective. A lot of times it’s used with other oils, such as lavender or tea tree oil or citronella or things like that, that may be used in addition to it. But what they found is that the oil of lemon eucalyptus is an oxygen mask for your bodily scent. When we sweat or when we exhale, those are the scents that mosquitoes are attracted to, and when you use oil of lemon eucalyptus, it masks those scents in such a way that it confuses the mosquito. So they may see you but they’re not going to smell you, and the likelihood of you getting bit is much, much lower. Allan (25:21): Cool. There was one part of the book that you got into when you started talking about mold that really, really hit home, because we bought this house and we got inside and there was a mold problem. My wife just knew it. She was like, “I’m sensitive, there’s a mold problem. We need to get this taken care of.” And so we brought in some guys and they went to clean our ducts. They’re like, “We can just clean the ducts and that’ll probably solve your problem.” Well, they actually stirred up all the mold spores, so within three days it was everywhere. It was horrible. So we had to bring in another expert, and this guy stripped out all of our duct work, got all of the insulation out of the attic, because there was mold everywhere. He helped us clean that up. It was not cheap by any stretch, but we got it done and now we’re in a mold-free house. Can you talk a little bit about mold, why it’s such a big problem for us and what people should be doing to one, determine that they don’t have a mold problem, and two, if they do have a mold problem, what steps should they take to remediate the problem? Janet Newman (26:29): First off I have to say, I’m so sorry that you went through that and I can completely empathize. Secondly, I’m so glad that your wife is sensitive because she was able to sense that something was off, and a lot of people can’t tell. Sometimes mold just doesn’t have an odor and it can lurk behind walls and ceilings and in air ducts and things, and they have no idea. And people just become ill and they don’t know why. So, mold is such a big problem, especially for flood-prone zones, but anytime that you have a leak or a spill in your home, mold only requires 24 hours to start growing. I should point out too that mold requires four things to grow. It needs moisture – obviously that’s a big one. It needs oxygen. It also needs the right temperature, usually between 40 and 100 degrees is kind of the sweet spot for mold. And it also needs a nutrient source. And when I talk about that, I mean things like paper or cardboard, dry wall, even carpeting. Those four things are in our homes all the time. And so it’s really important – the first thing I say to people is to make sure that you have a really good dehumidifier that is controllable, and that you can adjust the settings to about the sweet spot. Again, it’s about 45% humidity. It can be between 40% and 50% to be safe, but that’s the goal that you’re trying to reach, because mold is tricky. I think there are thousands of types of mold; I think it’s 100,000 types of mold that I read in one source. So we don’t always see it, we don’t always know it’s there, we can’t always smell it. If you suspect that you have mold in your home, there are so many different tests on the market today that you can use. Usually it’s just you take a dust sample and you send it off to a lab, and there are instruction on how to do all of that in the kit. Knowing what kind of mold you have is key. You can also hire someone – it sounds like you did, and we also had to do as well. They have all kinds of different little gadgets, but one of them is a moisture meter, and they can go around your home and test all of your baseboards and your walls to see if there’s potentially any moisture behind that you can’t detect with your eye. So yes, mold can cause a lot of health problems. My husband and I both had completely different symptoms to the mold that we were exposed to, and that’s why we didn’t think there was a common denominator there. He had arthritis symptoms and was actually diagnosed with an auto-immune form of arthritis. I was having migraine headaches that were just awful brain fog, migraines. And because those are so different, we didn’t think that it was being caused by the same issue. It wasn’t until my husband went to a functional medicine doctor, where she said she kind of noted the timing of our new home and when his symptoms started. And she said, “I think I want to test you and your wife for mold.” And it came back that we both had pretty severe mold exposure. It took a long time, and like you said, it’s not cheap. We had to remediate our home; it took almost a year. We had the cost of remediating the home and the cost of detoxing from the mold in our bodies. It took us quite a long time, it was about a year for both. Allan (30:56): My wife had to go in for surgery, because her sinuses had gotten so bad. They went in and thought the mold was in there, so they did some work there to basically scrape out her sinuses, for lack of a better description of what it was. She went through that. But the guy came in and was really good. Of course I was getting a lot of bad news. Every time he did something, he’d say, “Well, we pulled this away and we found that, and we did this and found that.” And it’s like the cash register’s ringing, but you have to do it. So we have all new duct work in the house. We have a dehumidifier that actually sits up in our attic and runs full time now. He did the black light irradiating and spraying stuff with, I guess it was peroxide, and probably some other chemicals I might not want in my house. But at that point the mold was the enemy, and it’s all hands on deck. This book, Living in the Chemical Age – I think it’s really a good opportunity for us to take that step back and really start to assess what our health is, and maybe some of these things that just might be around us that we haven’t paid enough attention to – the fluoride in our water, the chemicals that might be in our water, what’s in our air, what’s in our skin products and our sunscreens and our insect repellents, and obviously mold and other things that could be going on around us. And I like that I can get your book and say, “If I’m dealing with this kind of problem here, I want to know about this, I can go to that part of the book.” And it’s a really good brief understanding of saying, “These are the things I need to look for. I know what kind of filter I want now, once I get the test”, and all that kind of stuff. It’s really an actionable book to basically help get yourself away from some of these chemicals. I don’t think anyone can ever be completely chemical-free. As long as you’re breathing or bathing or eating or anything, there’s probably going to be some chemicals. But this book does go a long way towards helping us get healthier and being able to use that to somewhat diagnose if we might have a problem with the product, and then we can just exchange that product for something else. That form of substitution might be enough for you to realize, “I did have a problem with that chemical, or maybe I didn’t, but I go and do something else.” But the chemicals are all around us, so that’s the scary part of the book. But I think the good part of this book is that there are things that we can do about it. We just have to be aware. Janet Newman (33:35): Exactly. You can’t eliminate all the toxins in your environment; it’s impossible. One expert said that we’re exposed to 250 pounds of chemicals on a daily basis. So it’s impossible, they’re everywhere at this point in our lives. But you can definitely do a lot of things to reduce your exposure and to reduce that toxic burden in your silo. I try to give a lot of helpful tips and resources for people, so that it’s not so scary and people feel empowered that they can actually make healthier choices and really take control of their own health. Janet Newman (34:20): I’m glad you liked it. Allan (34:21): I did, I did. If someone wanted to learn more about you, learn more about the book, where would you like for me to send them? Janet Newman (34:27): Sure. You can go to my website – LivingInTheChemicalAge.com. I’m also on Instagram and Twitter, and my book is available on Amazon. So, there are lots of different ways to find me. Allan (34:41): Alright. Well, this is episode 323, so you can go to 40PlusFitnessPodcast.com/323, and I’ll be sure to have links there to the resources that Janet just mentioned. So again, Janet, thank you so much for being a part of 40+ Fitness. Janet Newman (34:56): Thank you, Allan. It’s been wonderful. Thank you so much. In her book, Living in the Chemical Age, Janet Newman lays out a solid plan to protect your family and yourself using some basic protective measures. In our discussion, Janet and I cover why chemicals are an issue, what is wrong with our drinking water, and how mold can become a huge issue. Allan (3:09): Janet, welcome to 40+ Fitness.